"You demonstrated a clear understanding of the issues and challenges facing business in Phoenix. We believe you are committed to fostering a healthy economic climate in support of business in Greater Phoenix." Following are bills Barbara sponsored during her tenure in both the Arizona Senate and the House of Representatives. This legislation raises the threshold for the submission of expert testimony in civil and criminal trials by moving the state to the Daubert standard, which is the same standard used at the federal level and in 37 other states. It will decrease the probability of "junk science" being presented to a jury and cuts down on frivolous lawsuits built on flimsy evidence. This bill was signed by the Governor. This legislation authorizes the State Parks Department to make emergency procurement contracts with a private management company or a public entity or a Tribe. The purpose is to assist in the operation, management and maintenance of our State Parks with the goal of keeping all of our parks open. This bill was signed by the Governor. This bill requires health professionals to disclose what they are licensed as when they engage in advertising. That way, the public can make informed choices when choosing a health care professional. This bill was signed by the Governor. This bill allows small technology based companies to receive a refundable tax credit for expenditures on research and development. Companies with fewer than150 employees can now choose to take a refundable credit which would allow them to put that money back into research. If a company chooses this refundable credit instead of a regular tax credit, the company only gets 75% of the allowable credit. This bill will greatly help small start up companies. This bill was signed by the Governor. This bill allows individuals to purchase a less expensive health insurance plan that fits their needs without all the government mandates. Arizona has had a similar product available for small business since 2006. That created a less expensive health insurance option for small businesses and has been successful in the marketplace. This bill gives individuals the same ability to purchase less expensive coverage. Individuals know what is best for themselves and their families. This bill gives individuals an additional choice in the individual health insurance market and allows a less expensive product to be sold in Arizona. The bill passed and was signed by the Governor. SB 1403 provides tax incentives for renewable energy manufacturing, research and development and for renewable energy headquarters. Becoming a leader in renewable energy, especially in solar, will provide Arizona with a new base industry that will supply high paying jobs and help diversify our economy. Arizona should be the natural leader in solar, but we have not been. These jobs were going elsewhere because Arizona did not have specific incentives in place to attract these companies. With the passage of SB1403, we can take our place as a leader in this rapidly growing renewable energy field. This bill was signed by the Governor and will be effective on January 1, 2010. Read more . . . This bill uses tobacco tax money to cover prescription medication to help people who are on AHCCCS stop smoking. Tobacco taxes, which were in the tobacco Education and Prevention Fund, were meant to be used to stop smoking but much of the money was being used in ways that did not accomplish this goal. They were being used for sports promotions with a side message about smoking cessation if you looked really closely. This bill takes that money and allows people on AHCCCS to get prescription medications to stop smoking. There is no State General Fund money used for this purpose. Smoking related illnesses cost the taxpayers a great deal of money. The State will save money on health care costs if people stop smoking. This bill passed and was signed by the Governor. This bill gives Good Samaritans immunity from civil liability if they use an Automated External Defibrillator to help save someoneâs life. These AED devices come with instructions and cannot cause any harm. It is important that no one hesitate to try to save someoneâs life for fear of being sued if they are not successful. This bill passed and was signed by the Governor. This bill addresses problems that have arisen with the proliferation of Med Spas. Problems such as corneal burns and serious skin burns have been reported as a result of laser treatments. This bill makes sure that people who use lasers are properly trained and properly supervised. Laser Techs already need to be certified but the regulations were very loose and no one was overseeing them. This bill does not create a new regulation but creates a comprehensive system for certification and oversight. The law already required supervision for Laser Techs but now the supervisor will be responsible to the supervisor's own regulatory board. If an untrained laser tech is working or if something goes wrong, the health care professional who is the supervisor is responsible in addition to the laser tech. The bill also requires the supervisor to be licensed in the State of Arizona. Supervisors are those individuals whose current scope of practice allows them to supervise. This includes MDs, DOs, Nurse Practitioners; Naturopaths and PAs. Training requirements for laser techs were increased. The bill also broadens the scope of practice for aestheticians to allow those who are trained in laser to do laser procedures. The bill also makes it clear who can administer Botox injections and other cosmetic injections according to the health care professional's scope of practice. This bill passed and was signed by the Governor. This bill would make sure that schools receive money from the General Fund to cover 90% of the actual utility costs they incur. Until 2010, school districts have been able to go the taxpayers on a primary property tax to cover the difference between their actual utility costs and the amount they paid in 1984 when this concept was adopted. That tax is set to end in 2010 and schools need a way to cover those amounts. Although taking this tax off the backs of the taxpayer is a good thing, no school should have to choose between keeping a teacher and keeping the lights on. This is going to be a budget issue. This bill puts reasonable restrictions on brand new teenage drivers under the age of 18 for the first six months after receiving their license. Other states with teen restrictions have shown a marked decrease in fatal accidents among this population. The bill restricts the number of teens who can ride with the new driver to one passenger, but there is no restriction on family members. The bill also restricts the teenager from driving between the hours of midnight and 5:00 a.m. unless going to a school, work or church sanctioned activity. This is a "secondary offense" law, which means a teen would have to be stopped for some other violation in order to be cited. There are fines and additional months added to the teen restriction for violating the law. The bill was signed by the Governor. This bill will help prevent identity theft. It requires Maricopa and Pima Counties to redact all social security numbers that are currently on their public websites, and requires all counties to redact social security numbers from public records before putting records on line. Small counties are also required to remove all social security numbers that are on line currently by request (most small counties are just beginning to post records on the Internet and currently only have a small number of records online). The Governor has signed this bill. This bill gives the County Recorders the authority to refuse to accept invalid liens. Up until now, liens were being recorded that were not valid. There was a system in place to fight the lien, but no system to allow the lien to be refused by the Recorder when it was clearly invalid. This made no sense and this bill corrects the problem. The bill was signed by the Governor. This bill requires Child Protective Services (CPS) to contact other states during an investigation if it becomes known there is a history of abuse in another state. If there are substantiated cases of abuse, that information is required to be used by CPS and the courts when deciding the placement of a child. This bill is known as "Haley's law," named for a little girl who died because CPS refused to contact Florida for the records that would have shown she was potentially in danger in the custody of her mother. The bill was signed by the Governor. This bill addresses the problem of workers compensation insurance carriers not paying doctors and hospitals in a timely manner. It is similar to the law passed in 2000 which addressed the problem in the private sector. Insurance carriers now must pay within a specified time frame and have to pay interest if the payments are late. The bill was signed by the Governor. This bill requires a bittering agent be added to antifreeze. There has been a significant problem with pets and small children ingesting antifreeze because it has a very sweet taste. The bill was signed by the Governor. This bill extends the Job Training Fund and adds some protections for small business and rural business. The bill sets aside 25% of the fund for small business and 25% of the fund for businesses in rural Arizona and keeps unused monies in the Fund for future use of these entities. The bill was signed by the Governor. This bill makes it a state crime to enter into or to be in Arizona while in violation of the federal immigration laws. The purpose is to have a second line of defense to protect Arizona when illegals get past the border patrol. Currently, when illegals are found running across the desert near the border, in drop houses or crowded into vans, police say they do not have the authority to hold the them until the Border patrol or ICE come, nor do they have the authority to transport them to Border Patrol or ICE. The police say this occurs because they do not have the authority to enforce federal immigration laws. This bill would allow them to enforce State law. The law would give the authorities the choice of arresting the individuals or transferring them to the federal agency with jurisdiction. This bill was vetoed by the Governor. This bill requires anyone convicted of a third violent felony be sentenced to life imprisonment regardless of where the first two felony convictions occurred. The only release possible would be after serving 35 years and only upon the commutation of the sentence by the Governor. The purpose of this legislation is to identify and remove from society persons whose conduct continues to threaten public safety through the commission of violent felonies. This bill was signed by the Governor. This bill allows people to order wine directly from both in-state and out-of-state wineries as long as those wineries are wineries which produce fewer than 20,000 gallons of wine a year. The wineries would have to obtain a domestic farm winery license and collect taxes for Arizona. The wine can only be delivered to an adult who is over 21 and shows a picture ID. The wineries would also be able to deliver directly to retailers without first going through a wholesaler. This bill was signed by the Governor. This bill requires all businesses and all government entities to redact or to destroy any documents containing a person's social security number, credit card numbers or other personal identifying financial information before disposing of those documents. This bill was a strike-everything amendment that I sponsored and put onto a House bill. This bill was signed by the Governor. This bill requires any document that is recorded on a public website be redacted of social security numbers, credit card numbers and other personal financial identifying information before the document is recorded. This bill was signed by the Governor. This bill would allow a person who has become disabled and unable to work and who has been receiving AHCCCS as a result of the disability to buy into the AHCCCS program if they have lost AHCCCS eligibility as a result of receiving Federal SSDI payments. Currently, the Federal Government gives someone disability payments but does not give them Medicare until they have been disabled for two years. The SSDI payments often put someone just slightly over the AHCCCS limit and the person is left with no health insurance for that two year period. This bill would allow the person to purchase, on a sliding fee scale, AHCCCS coverage for the two year period until Medicare kicks in. This bill was signed by the Governor. This bill allows a person who functions as a gardener to use products that are commercially available to the general public to spray weeds during the course of their work. This applies only if long as weed control is incidental to their work and that they notify the owner that weeds have been sprayed. They would be able to do this without having to have a license from the Structural Pest Control Commission. This bill was signed by the Governor. This legislation deals with the terrible problems that are created by the use of Meth in our society. It limits the amount of pure pseudoephedrine that can be sold at any one time, acknowledging the fact that this product is used in the manufacturing of Meth. It limits the amount of pseudoephedrine a consumer may purchase to 9 grams. It also requires stores to keep those pseudoephedrine products behind a counter .More importantly, this bill focuses on very strong penalties for those people who cook and sell meth.Â The bill requires a presumptive sentence of ten years for anyone selling meth or cooking it. Probation will not be allowed. When deciding on bail, the judge will be instructed to take into account the fact that these people pose a danger to society and rule accordingly. If a person is cooking meth in the presence of a child, the presumptive sentence will be twenty years, no probation and possibly no bail. If the person is cooking meth in the presence of a child and the child is harmed, the sentence will be life imprisonment, no probation and possibly no bail. The bill also allows DHS to fund prevention programs so that people understand how dangerous meth use is. Meth is highly addictive and causes violent and paranoid behaviors. This legislation encourages investment in technology- based start up companies in Arizona. Arizona start- ups do not have access to enough early stage capital, known as pre seed, seed or angel funds. To encourage the availability of this type of funding, investors will be eligible for a 30% tax credit over a three year period if they invest in small technology companies and a 35% tax credit if the investment is made is a bioscience or bio tech companies or in rural Arizona. The State has invested in research in our Universities but when it comes time to commercialize the ideas, the capital is not available and new companies are forced to look elsewhere for funding. Arizona invests in the research and another state reaps the benefit of the commercialized product. This legislation is designed to help these companies stay, grow and create high paying jobs in Arizona. This bill requires all public schools to incorporate skin cancer prevention instruction into existing curricula in grades kindergarten through eighth grade. âThe Sunwise Programâ is provided by the US Environmental Protection Agency free of charge to schools. It gives children the basic facts about skin cancer, including the negative impact of human exposure to ultraviolet radiation from sunburns and tanning, and instruction on how to reduce the risk of skin cancer. Arizona has the highest rate of skin cancer in the United States and the second highest rate in the world behind Australia. According to the American Academy of Pediatrics, 80% of a personâs lifetime exposure to the sun occurs within the first eighteen years of life. Effective sun protection during these years is projected to reduce the number of lifetime cancers by almost 80%. Arizona is the first state to pass legislation to make sure children learn the proper way to protect themselves from skin cancer. Barbaraknows this legislation will make a significant difference in people's lives and is proud to be its sponsor. This legislation requires companies who sell gift cards to disclose the existence of expiration dates or fees that are imposed as a result of non use of the card to the consumer before the card is purchased. It is not right that people pay full price for a gift card and find out later that the card has lost value due to these fees or that the card has expired entirely. At least now, the consumer will have the knowledge that these conditions exist and will hopefully say "no" to those companies that deduct value from the card if the card is not used in a certain time frame or that have expiration dates. Those companies will get the message when enough people buy their gift cards elsewhere. Senator Jim Waring and I co-sponsored this bill. The legislation increases the penalties for driving without insurance and requires the courts to impose the fines. The law previously stated that the courts may impose fines but this legislation states the courts shall impose the fines. The fine for a first offense is $500, the second offense is $750, and the third and subsequent violations are $1000. The legislation also requires the impoundment of the vehicle for thirty days if the driver is in an accident and does not have insurance and a valid driver's license. In addition, under current law, a vehicle shall be impounded if a driver is driving on a suspended or a revoked license. This legislation adds that the vehicle shall be impounded if the driver has no license. This legislation corrects loopholes in the law regarding contractors who are working on suspended licenses. There were no penalties for continuing to contract after your license was suspended. Under this legislation, the civil penalties will be up to $1,000 per violation. This legislation also requires the Registrar to maintain a website of people who are knowingly contracting without a license. This gives the public a place to check before hiring someone. The legislation also requires the Registrar to refer criminal violations to the local prosecuting authority. This legislation was brought forward by constituents in the Arcadia area who were having very serious problems with the remodels in their area. This bill provides substantial, new protections for taxpayers in dealings with the Arizona Department of Revenue. Effective August 23, 2004, the Department can no longer go after a taxpayer for failing to pay a tax of which he/she is unaware if the majority of the people in the same class are also unaware of the tax. In addition, the bill sets a two year limit in which an audit must be completed by the Department of Revenue, and requires the Department to provide the results of the audit to the taxpayer. This bill addresses the problem of lawsuits that are filed and pursued before there is evidence that the person being sued did anything wrong. These are the cases trial attorneys file with the hope that sometime, during the Discovery phase, information will be found that proves the defendant did something wrong. In fact, often the trial attorney hopes the defendant will just settle to avoid the costs associated with depositions. The costs are high in attorney's fees, time lost from work and the emotional trauma of being sued. Even when there is no evidence that malpractice has occurred, the person sued is forced to defend himself. The insurance company incurs significant costs preparing a defense and these costs are passed on to everyone in higher insurance premiums. The bill passed on March 10, 2004 and was signed by the Governor on March 17, 2004. Learn more . . . Grounds for cancellation - addresses problems new home buyers experience when their insurance company cancels their homeowners insurance after they have moved into the home, based on information found on a CLUE report. Premium increases - protects homeowners from rate increases due to claims of less than $500 for which the insurance company has not made a payment. Learn more . . . This bill allows out of State wineries to ship wine to Arizona when people have visited their winery. It also allows in-State wineries to ship wine. Learn more . . . Eminent Domain - For the first time, private property owners now have some legal protections when a government entity tries to take their land for a public purpose. The condemning authority is now required to give notice before filing an action; pay to the owner the full market value for the property; and pay all court costs if it changes its plans and does not proceed with the taking. Vehicle Salvage Titles - As a result of this bill, you now have the security of knowing exactly what you're getting when buying a used car. Previously, insurance companies were legally allowed to apply for "clear" titles on recovered stolen cars even if the air bag system had been removed, rendering the car structurally damaged and unsafe to operate. This law requires a recovered stolen, damaged car to carry a "salvage" or "restored salvage" (if it was repaired) title so the buyer is aware of the car's history. Pool Construction - Pool builders can no long require more money upfront than the value of the work performed. This bill was a result of disreputable builders taking large amounts of money then leaving town - literally leaving people "high and dry" with only a hole in the ground after they had paid for the pool. This solution was developed in cooperation with the pool industry to ensure their needs are met while protecting consumers at the same time. Among Arizona's greatest economic assets are our "right to work" laws and friendly business climate. Barbara has stopped many bills that attempted to undermine Arizona's right to work statutes, destabilize the unemployment tax fund, increase business exposure to lawsuits or impose additional regulatory or tax burdens on small businesses. 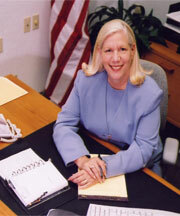 As a result of her leadership on business and economic issues, Governor Hull appointed Barbara to the Leadership Council overseeing Arizona's 2002 Statewide Economic Study. Undertaken approximately every 10 years, the SES is the framework on which Arizona's new long term strategic economic plan will be based. The Study will analyze Arizona's current economy; describe emerging global trends and business practices and their impact on the state; and identify key industry growth opportunities for Arizona's various regions. Barbara understands the importance of participating in the electoral process and is concerned that many of our election laws are too difficult and complex for people to navigate. Her 2001 Election Reform bill clarifies, simplifies and consolidates the laws that regulate activity on behalf of candidates and issues. Barbara believes that you shouldn't need to be a lawyer to advocate for your ideas! Firefighters willingly risk their lives and health for us everyday and are exposed to many toxins in the process. Scientific evidence has shown strong links between exposure to toxins and some kinds of cancer - particularly in young firefighters. Although job-related, worker's compensation has never covered firefighters for these diseases. Barbara's legislation helps thousands of firefighters and their families by providing a mechanism for worker's compensation coverage for those diagnosed with certain types of cancer that are presumed by scientific evidence to be directly related to their job. Technology and the Internet have spawned a worldwide economic transformation that affects every person, every job. To help define the "New Economy" for Arizona, Barbara served on the Governor's Arizona Partnership for the New Economy (APNE), one of the broadest economic assessment efforts of its kind. During the 2001 legislative session, Barbara served as APNE's Legislative Hot Team Chairman and was responsible for securing funding for assessments of telecommunications infrastructure for small and rural communities, and high tech clusters which attract high paying, quality jobs to Arizona. Barbara sponsored this landmark legislation to reform Arizona HMOs that many herald as a model for Congress to tackle the issue at the federal level. Read what the 2000 HMO Reform Bill means for you. The 2000 election marked the first time citizens receive the information needed to cast informed votes. Rep. Leff's bill required the state to mail these Pamphlets directly to every voter's home. Arizona has become a leader in cancer drug discovery as a result of Barbara's bill. It speeds up the time it takes to get drugs to cancer patients by allowing all phases of testing required by the FDA to be conducted in the state. In addition, this bill made possible a dramatic increase in clinical trials for Arizonans battling cancer. Read about the contributions to the fight against cancer resulting from this investment.